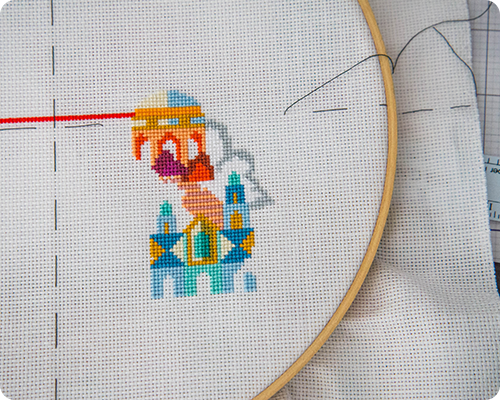 Counted cross stitch was something that I did years ago and then sort of abandoned as I developed new hobbies and interests. If you had asked me even a year ago if I would ever come back to cross stitch, I would have responded with a definite "no". It just did not feel like the craft for me anymore, and furthermore I had not seen any patterns that I liked or that I could see myself hanging in my home when finished. But then something changed. 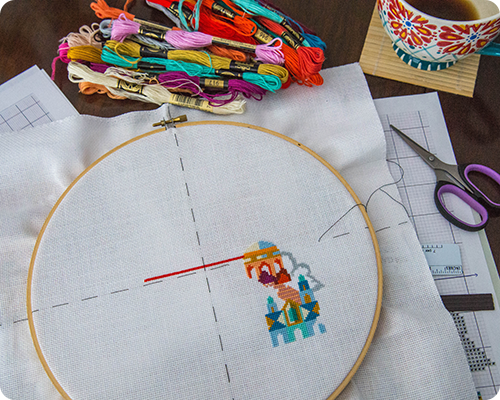 When my surgery was booked and I was looking to fill my time at home with crafty pursuits, my thoughts unexpectedly turned to cross stitch; I could not tell you why I began thinking of cross stitch, the source of this inspiration remains a mystery even to me, but I did. So I headed over to Etsy to see what I could find, and a quick search for "modern cross stitch" brought me to the most perfect pattern: the skyline of San Francisco, the city we will be traveling to in about a month. I ordered the pattern, collected all the floss (so much) that I needed, got my Aida cloth ready and started stitching. For the last few weeks, each morning, after Steve has headed off to work and the girls have left for school, I reheat my coffee in the microwave and settle down for an hour or so to work on my cross stitch picture. This is not a fast craft at all, as I can only really work on it in little bursts, and in the right light....but I am really enjoying it...and when you do a little everyday, eventually it all comes together. My favorite thing is how colorful it is. And I have the perfect place to hang my picture when it is done. I'll be posting updates here as I work on my picture if you want to follow along. And the fact that I went back to a craft that I had done many years ago made me wonder if you've ever done the same, and if so, which craft? Joining in with the Winter Project Link Party at Thistlebear. I love cross-stitch and did three big projects last year. I haven't done any yet in the new year, but I have a few projects planned. I love that designer, her work is really beautiful and I've enjoyed doing a few of her designs. I love that you are familiar with this designer. I am really enjoying this project - the pattern is very easy to follow and the colors are gorgeous.